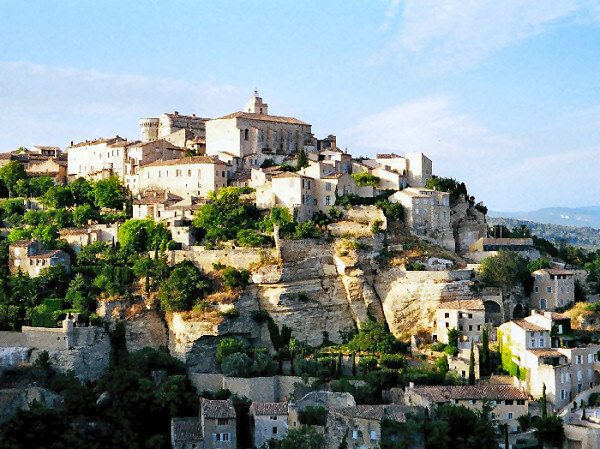 Provence evokes strong images for most people; sunflowers, lavender, landscapes of vineyards and perched villages, the Mediterranean food, the stunning and often beautiful scenery, the rich history and of course the lovely, year round sunshine. 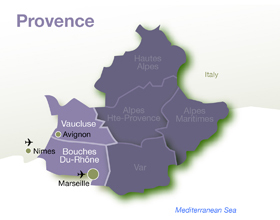 The Region The Provence that we know and love is bordered by four large cities; Avignon to the north, Aix en Provence to the east, Marseille to the South and Arles to the west. Within this region there is some stunning scenery. 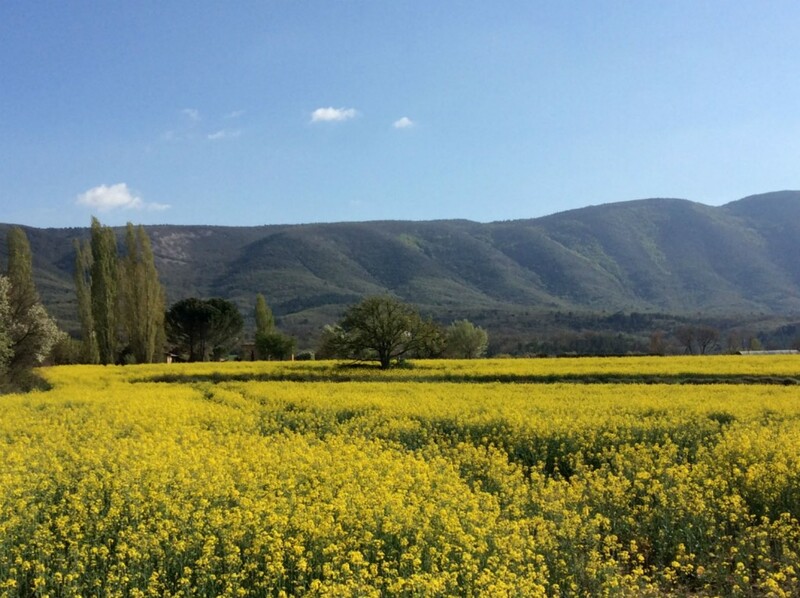 The Luberon Regional Natural Park is dominated by the Luberon hills, a land of vineyards and orchards, sprinkled with beautiful, perched, hilltop villages. Mont Ventoux dominates the scenery in the north of the region From 60 miles away it rises from the hills around Vaison-la-Romaine. For cyclists the mountain is legendary. This is the daunting climb that breaks spirits and makes heroes. It's a relentless but hugely rewarding slog up a 6,000ft mountain, starting in pine woods and ending amongst the barren and almost lunar landscape of screes of shattered white rock. This is the notorious mountain on which Tommy Simpson died when trying to make up time on the 1967 Tour de France. This extraordinary place has a special fascination for British cyclists. Then there is the Rhone. At its estuary where it meets the Mediterranean is the Carmargue Natural Regional Park, famous for its flamingos and white horses, migrating populations of birds and the bulls that are bred in abundance on this fertile land. Further up the river and it is the wine regions that dominates the landscape. Wines renowned the world over; Cotes du Rhone Villages, Chateauneuf du Pape, Gigondas ands Vaqueyras. One of our favorite areas has just been made Parc Naturel Régional . The Alpilles are a chain of limestone hills running east-west, an extension of the Luberon mountains. 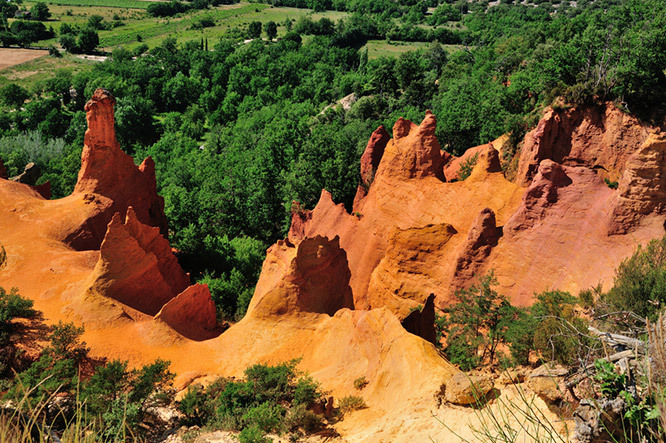 They are a little less well known than the Luberon, benefiting from quiet roads and stunning scenery. The ridge along the top is bare rock, white and barren, which contrasts with the slopes below, rich in almond trees, apricot trees and olive groves. This makes for a beautiful panorama through which to spend time cycling. In contrast to this, there are also shaded roads, winding through pine forests and beautiful villages at which to rest or lunch. 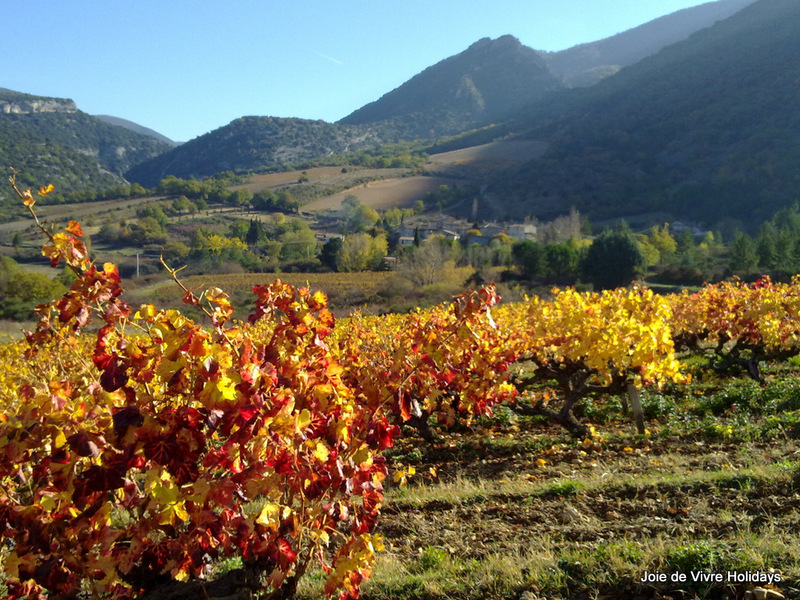 It is very much the climate that really defines Provence; Long balmy summers with temperatures regularly in the mid-thirties, late gentle autumns and mild sunny winters, with an occasional blast from the renowned and violent mistral wind. 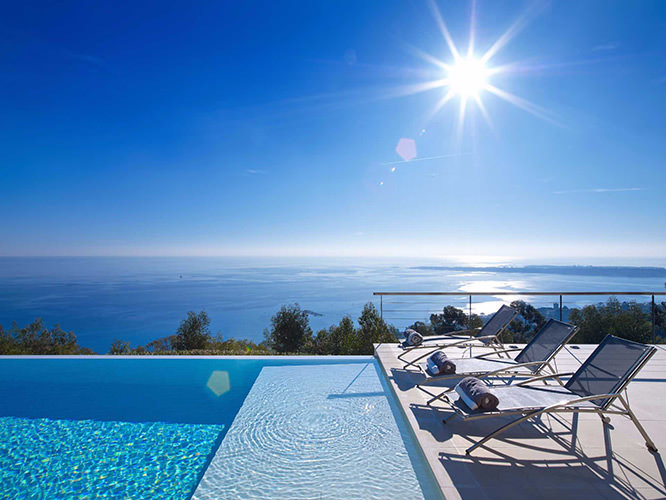 Many coastal areas of the region are blessed with up to 330 days sunshine a year, and generally most areas in Provence benefit from at least 300 days of sunshine per year. The Mistral is a weather phenomenon that, as with many aspects of French weather, has a lot of local folklore attached to it. The wind actually blows down from the Alps in the North East and when certain weather conditions prevail, the wind is channeled down the Rhone valley. The valley acts as a funnel, ensuring that there is an added intensity and ferocity to this wind. Local folklore suggests that it will always blow in blocks of three days (i.e. 3, 6 or 9 days) and when it blows for prolonged periods, it is said to send people mad! Despite the fact that it is a cold wind from the mountains, it generally brings beautiful sunshine with it. The wind blows any clouds and poor weather systems out to the Mediterranean Sea, leaving a trail of intensely deep, blue, cloudless skies. Rainfall is generally low in Provence with generally less than 50 days rain a year. The local markets are a must when you visit this area. They are a feast for the senses! 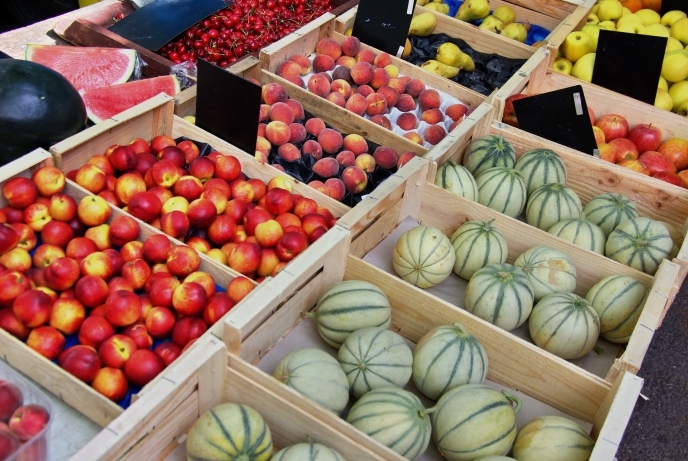 The colours of the fresh produce are vibrant and bold, the smells of lavender and fruits or fresh seafood Paella being cooked, drift around you. There are so many to choose from as well. Practically every village has a market day and the bigger towns often have enormous markets that take over the whole of the town centre. There are also night markets as well as winter and Christmas markets. If you visit this part of the world you cannot escape the markets, and nor should you! If you want to know which ones to visit, let us know and we'll be delighted to help. Getting to this part of the world has become unbelievably easy over the past few years. The TGV runs to Avignon and in the summer there is also a direct train from London to Avignon. Nimes - 1 hour away from most properties. Marseille - 45-60 minutes away from most properties. Toulon - about 90 minutes to 120 minutes to most properties.